Los Angeles Dismantler is a business devoted to one function: gathering wrecked Porsches and reselling the parts that can be salvaged. National Geographic went inside the company for a glimpse at ripping apart fine German engineering. The video comes from National Geographic's "Break It Down" series, and in typical TV fashion focuses as much on the personalities as the business. Since Porsche tends to keep its engines and transmissions safely tucked away from the frontal impact zone most often involved in crashes, there's frequently a lot of valuable components in even the most smushed Stuttgart creation ($400 brake calipers, anyone?). 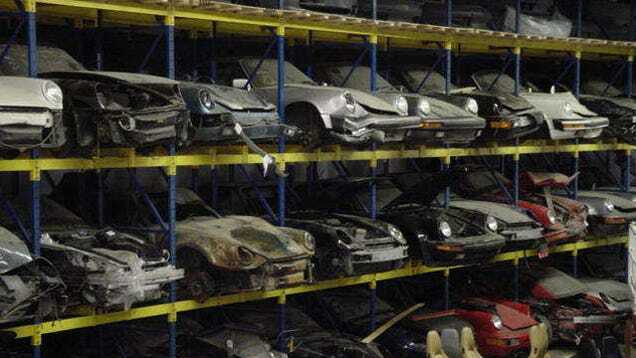 But Porschephiles will have their own sport trying to ID the various models in the charnel house that pop up for only a second. The episode premiered last night, but you can catch a glimpse of it below and in reruns on the National Geographic channel.